Let your daily commute pay for itself! Start recovering some petrol money now! Petrol costs in Singapore are quite high, and if you sign up for GrabHitch through AA you will have one less thing to worry about by having your commutes pay for themselves! We are a social carpooling service that matches everyday drivers to riders travelling the same route. There is no obligation to do rides on a regular basis because you’re NOT a taxi driver or car service! You never know who you will meet on GrabHitch – perhaps a colleague in your own company, a prospective client or maybe even your future boss! Signing up only takes 5 minutes and you can do it straight from your mobile phone! Simply open the Grab App and follow the steps below. Specially for AA Members, from now to 31st July 2017, get $20 credit in your driver wallet when you sign up and complete your first GrabHitch ride as a Hitch Driver with referral code HITCHAASG! * Your application will be approved in 1-3 business days. This incentive is only eligible for new drivers who sign up and successfully complete 1 Hitch ride as a driver between 21st June 2017 @ 00:00 hours – 31st July 2017 @ 12:00 hours. New drivers must sign up with the referral code HITCHAASG in order to qualify for the $20 credit. The processing of the $20 credit will only be conducted after the incentive period has ended (post-31st July 2017). Please allow up to 10 working days for the receipt of the $20 credit. 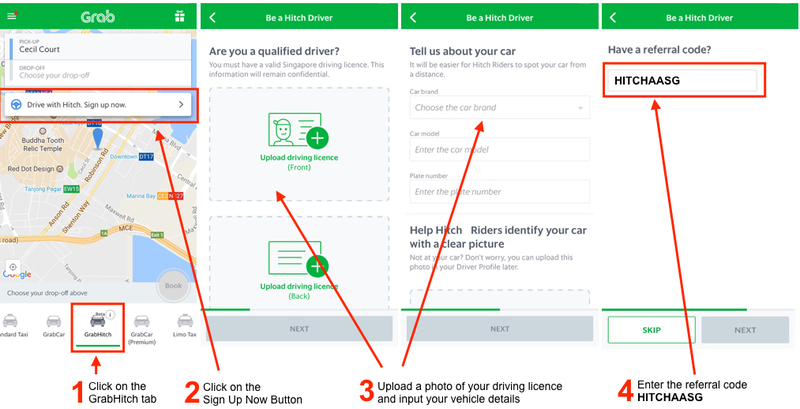 If you’re still not sure how to sign up, or have any questions regarding GrabHitch, email us at grabhitch@grab.com with the Subject: HITCHAASG and we will get back to you in 1-3 working days.